Doing well by doing good? 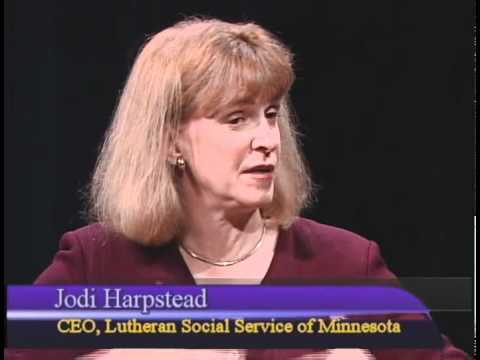 Jodi Harpstead is making over $300,000 a year to seed St. Cloud and other Minnesota towns with Somali Muslims. They had total revenue of $103,135,439 and received $91,887,312 from GOVERNMENT FEES AND GRANTS. (Go here and click on ‘financials’ to see for yourself). That makes them 89% government funded! That is a government agency not a charity, and surely not a ‘Christian’ charity! The progressive ‘religious Left’ is living off of the US taxpayer! Salaries and payroll accounted for $57,929,172 of your money—your tax dollars for that one year! Jodi doesn’t pull down a salary as high as Peterson (LOL! War on women?) her predecessor did, but it is fairly substantial none-the-less as we learned from a recent Form 990. She was compensated with $280,812 and an additional $42,495 came from related organizations (whatever that is!). Her second in command, Kenneth Borle, made $202,087 and $33,192 (from related organizations). They have 8 other employees making over six-figure salaries! Go here for the others in leadership at Lutheran Social Service of Minnesota responsible for building the aggressive and demanding Muslim population of the state. The main office of Lutheran Social Service of Minnesota is here (below). It is time to let them know how you feel, to put the pressure on the organization directly responsible for disrupting St. Cloud. Good Lutherans especially need to speak up! One more thing! Tell Rep. Trey Gowdy what he has in store for his community if a refugee resettlement site is established in Spartanburg, SC. See our complete archive on St. Cloud here. And, click here, for an enormous archive on Minnesota. See especially our earliest post (2011), and one of our top posts of all time, when we first learned of the three ‘Christian’ groups swamping Minnesota with Somalis at the behest of the US State Department. *** An indicator that the heat is on some of these phony Christian organizations is that they are changing their names. Note that World Relief Minnesota is now Arrive Ministries and Lutheran Social Services of New England is now Ascentria Care Alliance (here). Those are ridiculous salaries. Its like they are running some major business or something. These leeches. Ladies and gentlemen this man in this picture is called Abdul Kulane. He run for office city council ward 1 but he is a fraud in the community. He does not report his income because he lives with his mother on section 8 voucher. Mother collects food stamps, The is man is milking the system and should be reported. Somali people are proud people but dont care about this man. I AM SOMALI WOMEN REPORTING HIM WE CARE USA! USA! This all started with the change that took place in the 1965 immigration laws. The so called civil rights movement beyond the Bill of Rights began the multicult of death to take down European power worldwide and in time this will balkanize America. LSS has brought in Muslims from the former Yugoslavia to the southeast as well. The intellectual terrorism of political correctness is destroying America’s very founding fabric one thread at a time. Contact your legislators in Washington DC to sponsor a Bill to change the law back to having wholly European stock and to deport those who want the “American Way” to bring about change in their own lands rather than drag us down with their sinking ship. You realize America was founded on immigration, right? The founding fabric of America was that of a melting pot. This answers all the questions I have had concerning all these Somali coming here in St. Cloud. This is beyond outrageous! To be honest, some migrate there on their own from other parts of the state (attracted by the first group) and from across the country, but the direct resettlement from Africa and elsewhere is being done by this Lutheran organization, and the other two I mentioned. They would never have been in Minnesota in the first place twenty years ago if it wasn’t for the three “Christian” (ha! ha!) charities! I feel like I am in airplane that is going down in the French alps and this woman is at the controls. Yes, and all the while she tells herself she is doing God’s work! This is so depressing. And to think 20 years ago Newt Gingrich had identified the problem as the funding that the left was getting. Who would have guessed that the professional left would find a permanent and growing supply of funding from this program? All this while growing the Left’s consituency to boot. It would be one thing if these “religious” groups were passing the plate in church and synagogue to collect private money for their charity, but it is so maddening that poor taxpayers who might be working two jobs to send kids to college are paying for the Lutheran’s “charity” for Muslims!